Longer looks in necklaces, 25 inches or more in gemstones, glass, gold and silver! Some have clasps, some slip over the head without them...you can wear long or double them up...Ropes can be tied simply like a lariat or wrapped around for multi-strand ideas. Stainless steel shapes have spikey edges like flower petals, sun, or gears. At top of pendant is aqua blue dot in center, the middle section has pattern under clear acrylic dome with tiny pacific opal color crystals on each side. Steel links with crystals join this to final piece that has another pattern under clear dome, midnight and pacific blue crystal accents. Suspended in fixed position from long chain. Colors featured include bright turquoise and vanilla, violet on ivory. Length on stainless chain adjusts 24-28"
Dramatic pendant is made with stainless steel ornate pieces, joined for flexible movement by jump rings. Solid colors that look like stone cabochons are perhaps formed in resin, there are patterns under domed clear acrylic at the center. All accented by tiny crystals in pacific opal and champagne color. Colors featured include vanilla, golden brown, aqua. Sturdy gauge of brass sheet has embossed numerical pattern, very subtle, solid back is joined to front and elevated by rivet nails. Tropical floral artwork mounted to the top of the back piece is seen through the windows in the front. Iron-wrapped bar and ring to finish the pendant that is 3-1/2 x 1-3/4 inches overall. Suspended from simple oxidized interlocking rings chain, 30 inches long with shepherd hook clasp, or shorter wherever you hook it. 30 inch long necklace has silverplated toggle clasp in back. At center is 2-3/8 inch pendant of polymer clay. There are 7/8 inch flat round 2-sided polymer beads midway up each side, strung with all shapes of beads that include vintage Czech glass, blue lace agate, Swarovski crystal, sterling silver and glass seed beads. 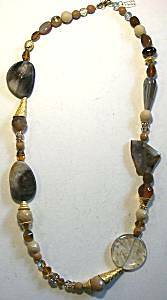 Elegant and bold, this is a 38 inch long necklace, no clasp, just slip over the head. Sections are built on golden wire, joined together and with goldplated chain. 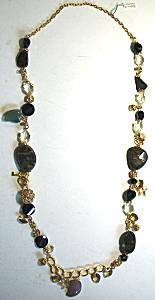 This is a substantial piece as it features larger gemstones and beads. The largest pieces are the greyish-brown agates, 1 inch across, irregularly shaped, flat and polished just on the top surface, the sides are rough rock and imperfect like nature. 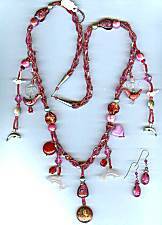 At center bottom is a dangle of another polished stone that looks like perhaps rhodonite in a soothing mauve color. There is also a green aventurine (or similar) stone dangle, jet black and clear crystals, rhinestone clear/gold balls, champagne crystal stars and hearts. 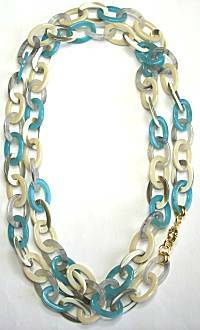 Longer necklace with lots of geometric interest, and love the pairing of black-and-white patterns with pastel colors. The stainless steel cut elements are light, joined by jump rings to curve around any neck, tiny hematite gray crystals dot each one. Colors featured include black, white, pastels of yellow, aqua and lavender. Length on stainless chain adjusts 20-24"
Design span along front: 13"
Longer necklace has dramatic style from all the shapes of lasercut stainless steel. Joined together to form a more organic look, the patterns under clear resin off an asymmetrical interest, accented by tiny glass and crystal beads. Fancy chain extends to the adjustable back. Colors featured include turquoise, soft brown, sunny gold and orange. 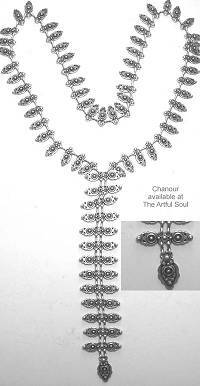 Length on stainless chain adjusts 31-35"
Ornate elements curve around neck for 29 inches, no clasp. Those pieces are 3/4 inch wide. Joins to an 8 inch long pendant made of 1-1/2 inch wide elements. Each element is cast in pewter, antique silver plated for satin sheen, lead and nickel free materials. Made in Turkey, weighs about 4.3 oz. 30 inches long, this is a bold and substantial necklace, highlighted with goldplated findings to lend a dressier and elegant look. Lobster clasp in back, beaded on wire. The large gemstones we can only guess at what they are, as they are extraordinarily unique! The largest pieces are flat and about 1-1/2 inches across, a rutilated quartz, and gray marbled agates that are slightly faceted and polished on the top, with sides unfinished and imperfect rock. There are goldplated beads with satin finish that remind of Columbian art. There are crystals in colors like honey amber and champagne, rhinestones sparkling clearly from gold.